Who Now Holds the Balance of Power in Nigeria? 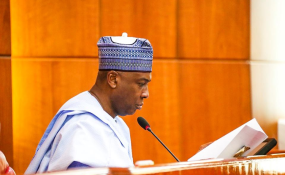 Abuja — The Nigerian National Petroleum Corporation (NNPC) yesterday denied having any hand in the alleged plot to unseat the Senate President, Dr. Bukola Saraki. The corporation distanced itself from the plot and also denied an allegation that it was funding the plan. The Group Managing Director, Dr. Maikanti Baru, was alleged to have doled out funds to aid the impeachment of Saraki . But a statement issued in Abuja by NNPC's Group General Manager, Group Public Affairs Division, Mr. Ndu Ughamadu, described the report as the handiwork of mischief makers seeking to drag the NNPC and Baru into a purely political affair totally different from its mandate as the national oil company with fiduciary responsibilities to the government and people of Nigeria. Ughamadu stated that the report was not only false but also an affront on reported reforms carried out by Baru at the corporation. He explained that the reforms have witnessed irreversible strides in the area of transparency with the sustained publication of NNPC monthly operations and financial records. The NNPC GM further said it was mere fiction and outright 'tales by moonlight' for anybody to insinuate Baru or anybody else could just take a dip into NNPC's account and dole out the volume of funds being portrayed in the report for political purpose. Ughamadu called on all well-meaning members of the public and oil and gas industry stakeholders to discountenance the report, noting that the NNPC was committed to its statutory role and responsibility to the entire federation.